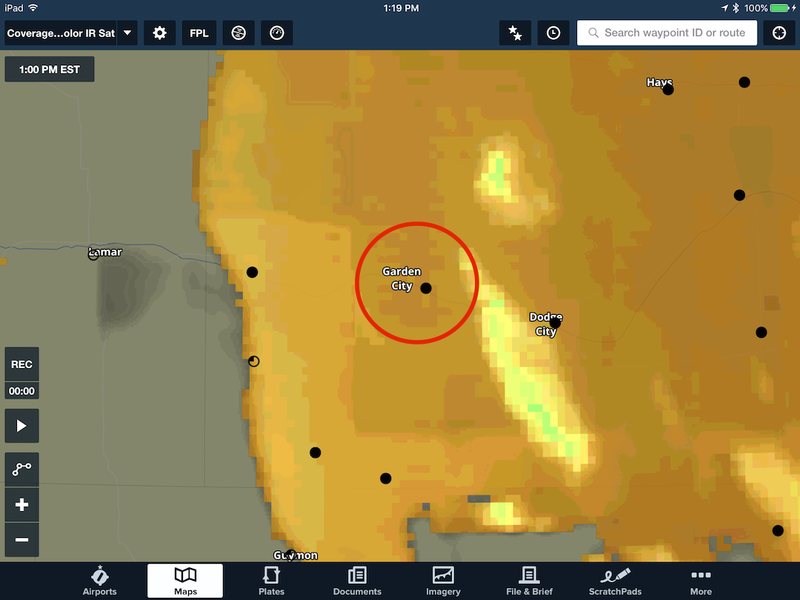 If you surveyed a group of IFR pilots, tops are likely one of the most requested features. Now, the wait is over. 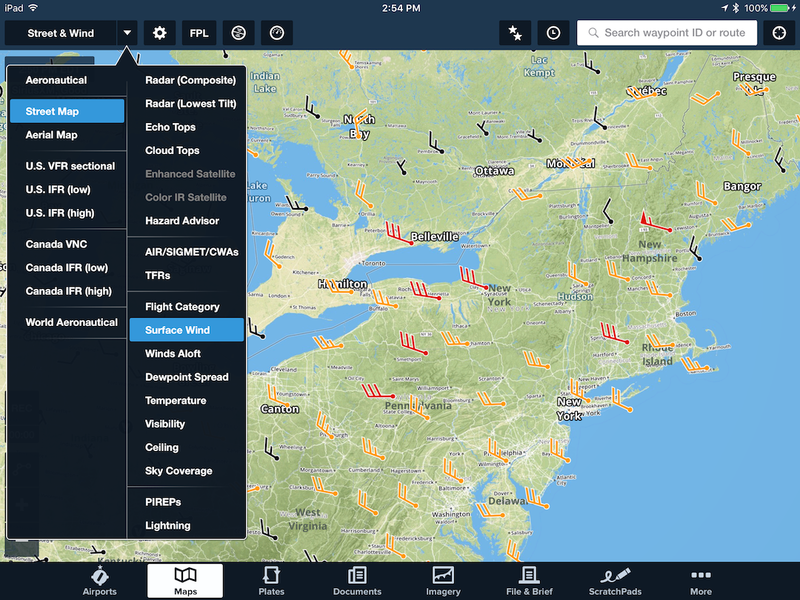 With ForeFlight Mobile 8.3, you can view both echo tops and cloud tops when connected to the SXAR1 SiriusXM satellite receiver. 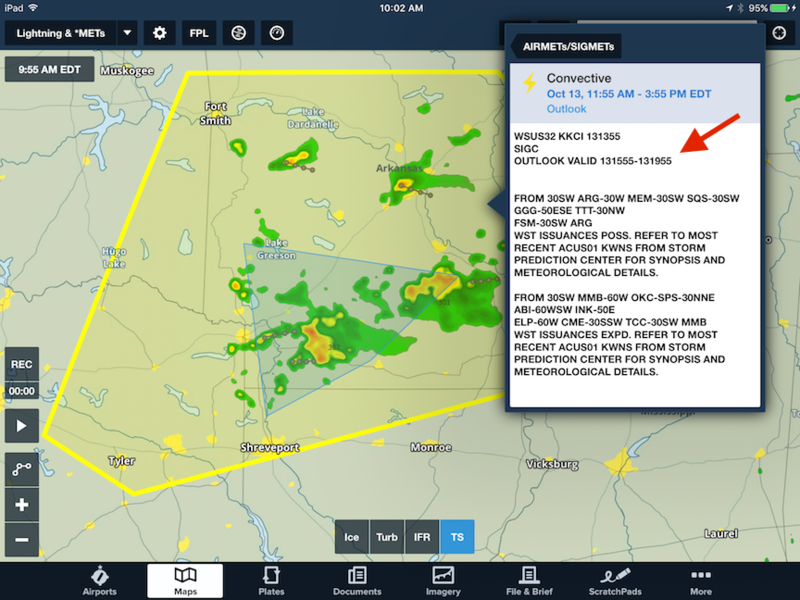 These two sought-after weather products are now included with the current ForeFlight Mobile SiriusXM pricing tier at no extra cost. 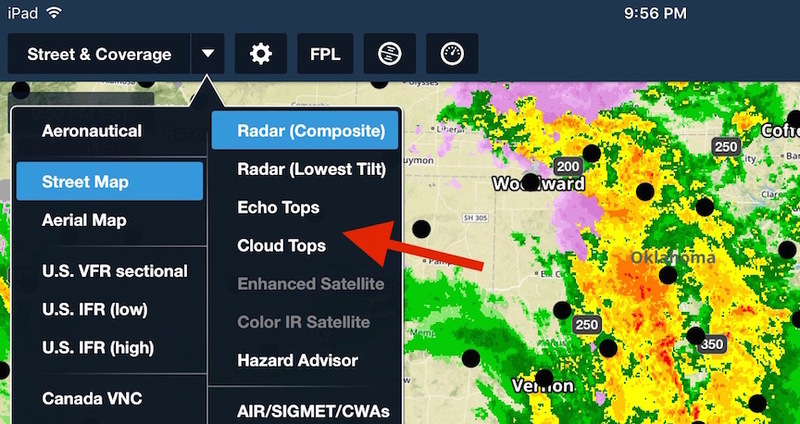 You can find the echo tops and cloud tops selections in between the radar and satellite layers in the ForeFlight Mobile app. 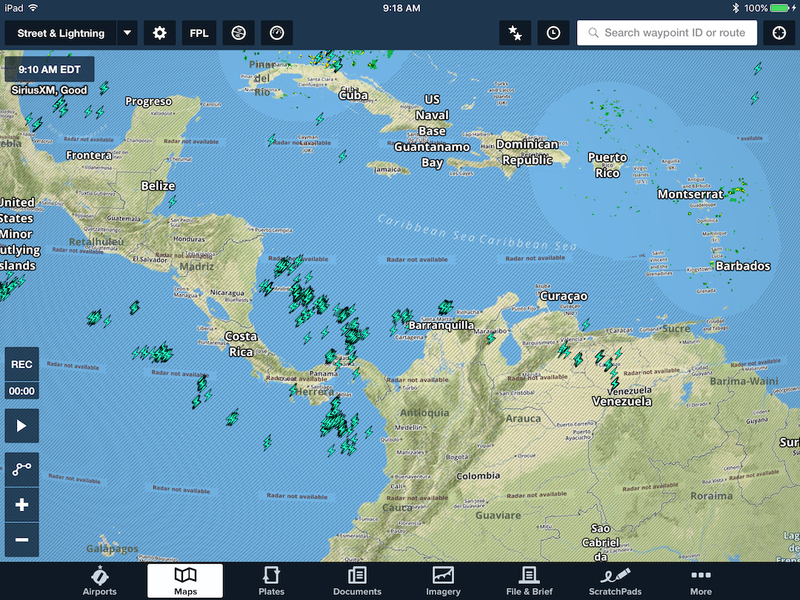 First and foremost, the cloud tops depiction from SiriusXM is not a satellite image per se. Instead it depicts the height of the cloud tops in reference to mean sea level (MSL). 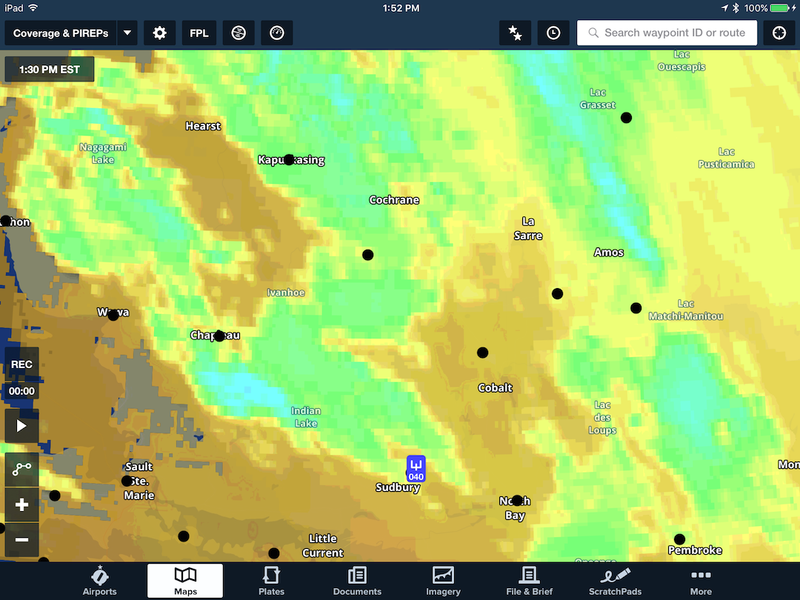 Second, the cloud tops overlay does not infer the depth of the cloud layer. 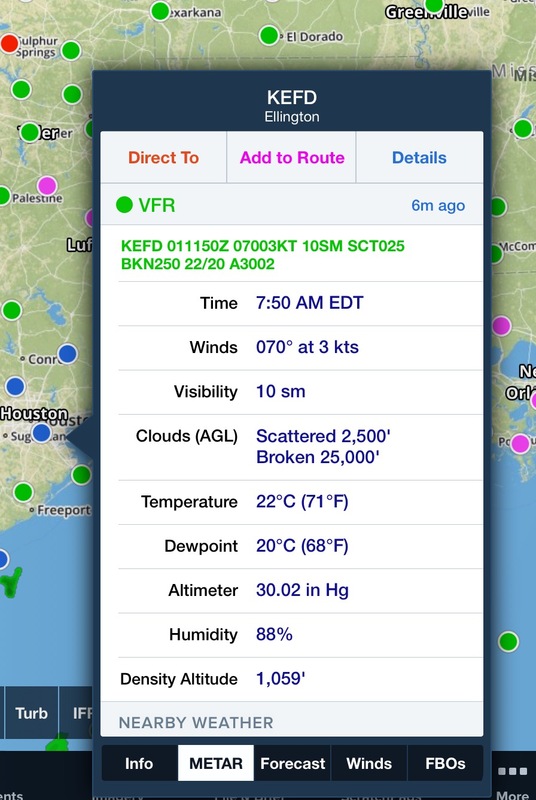 Consequently, a high overcast cirrus deck at 30,000 feet may mask one or more cloud layers below. 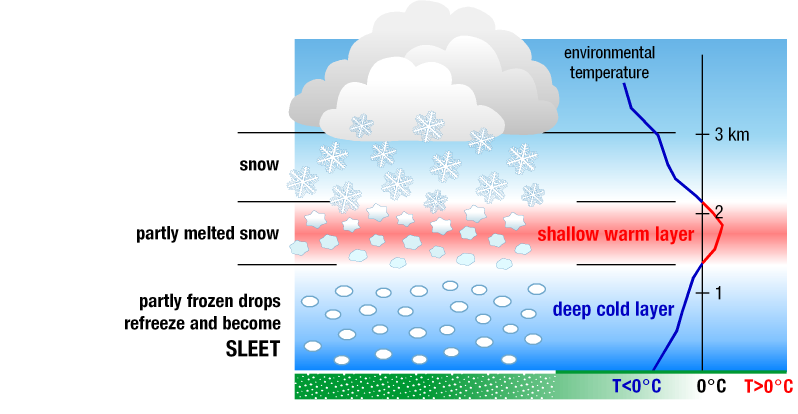 Third, not all cloud layers may be shown, especially when there are regions of low-topped stratus or scattered to broken fields of fair weather cumulus clouds. 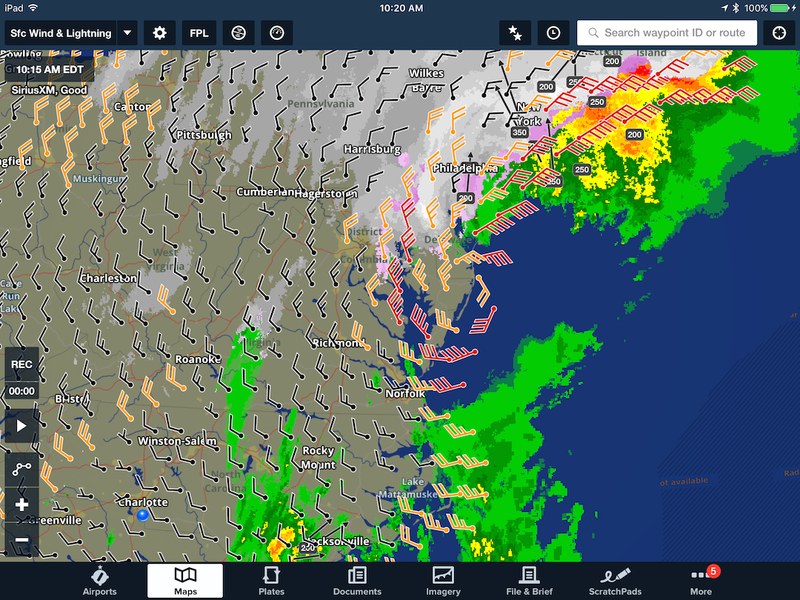 So it’s important to always overlay the sky coverage markers to augment the cloud tops layer. 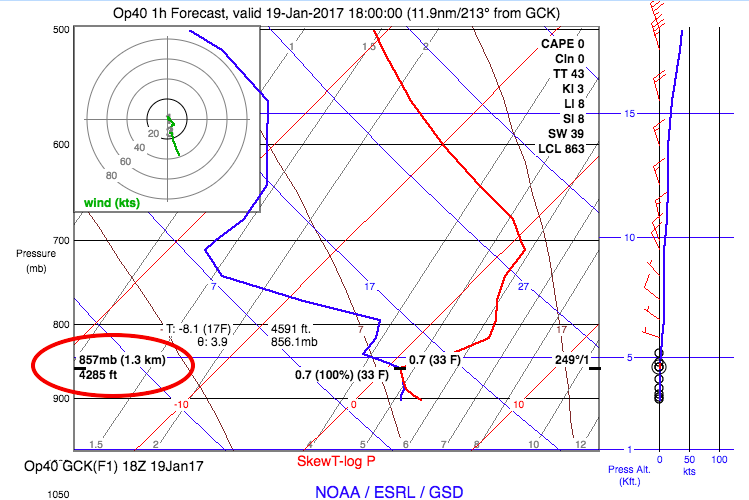 Here’s a common limitation during a low-topped stratus event. 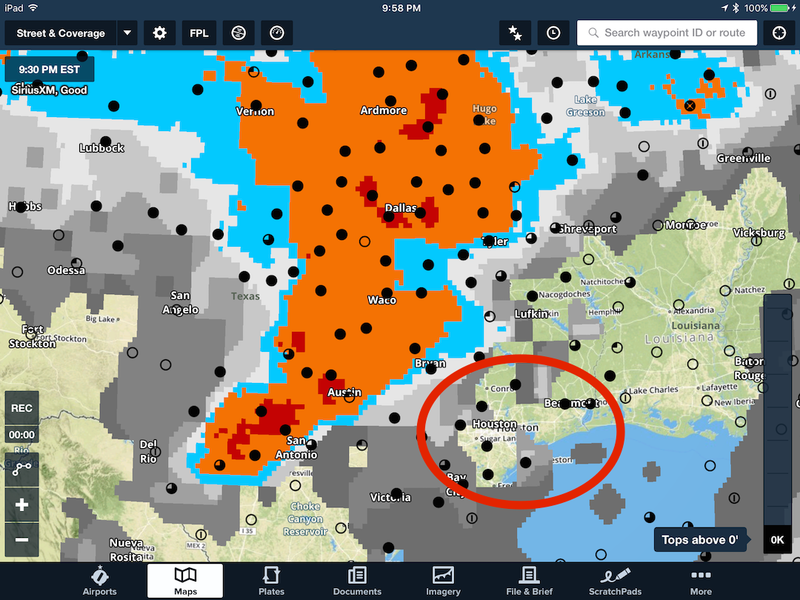 Notice that the sky coverage markers around Houston, Texas indicate the presence of overcast skies, however, the cloud tops layer shows the sky as clear. The cloud tops layer is always valid in the recent past since it’s based on observed data. It is typically updated with a new image once or twice an hour. Tops above 25,000 ft MSL are color-coded using blue, orange and red to visually enhance the highest tops. Tops below 25,000 ft are shown as simple shades of gray. The echo tops layer (left) may appear to look like a radar depiction (right) from a color perspective, However, it has a much lower spatial resolution than the composite or lowest tilt radar mosaic. Like cloud tops, echo tops depict a height above mean sea level so it’s not a radar depiction per se. Simply put, echo top height is based on the highest elevation angles at which greater than 18 dBZ reflectivities are detected. Keep in mind that echo tops are primarily used by meteorologists to identify more significant storms by locating the highest tops. So it’s important know that echo tops are not the same as cloud tops. The actual top of the cloud is always higher than the echo top. 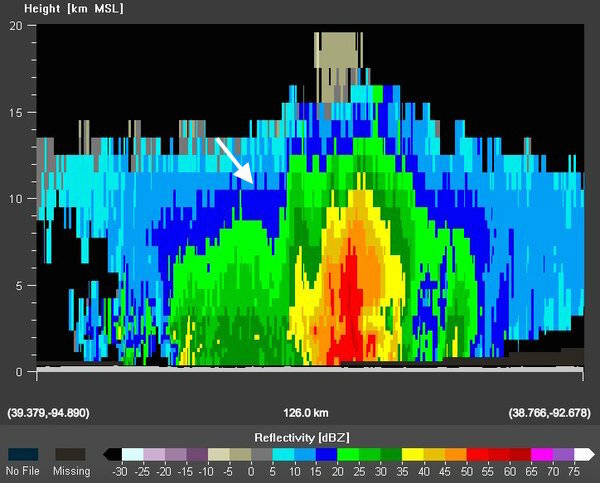 In this vertical cross-section of a thunderstorm, reflectivity is shown using colors similar to what you would see on a NEXRAD mosaic. Dark blue represents a reflectivity of 15-20 dBZ. So, the echo tops are likely found near the top of the dark blue regions on this image. 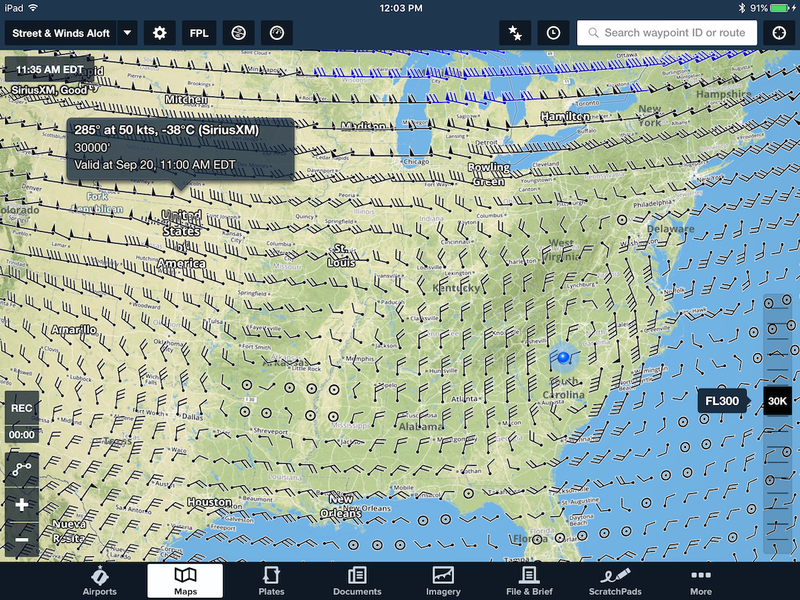 On the ForeFlight Map view, both the echo tops and cloud tops can be filtered by altitude. When selecting either one of these layers, an altitude selector similar to the one that appears with the winds aloft layer is shown. This provides a quick way to determine tops that are above a selected MSL altitude. Initially, the altitude selector will be positioned at the lowest setting, namely, 0 feet MSL. This is the selection that will show all cloud or echo tops. Setting the cloud tops altitude selector to 10,000 feet, for example, will remove any clouds with tops below this altitude leaving only clouds with tops above 10,000 feet. Therefore regions without tops data are regions without clouds or tops that are below the selected altitude. The altitude selector allows you to filter all of the cloud tops (or echo tops) below a specific altitude. In this example, all cloud tops below FL300 are removed leaving only those tops above that altitude. For convective tops, it’s also a good idea to overlay the lightning layer. 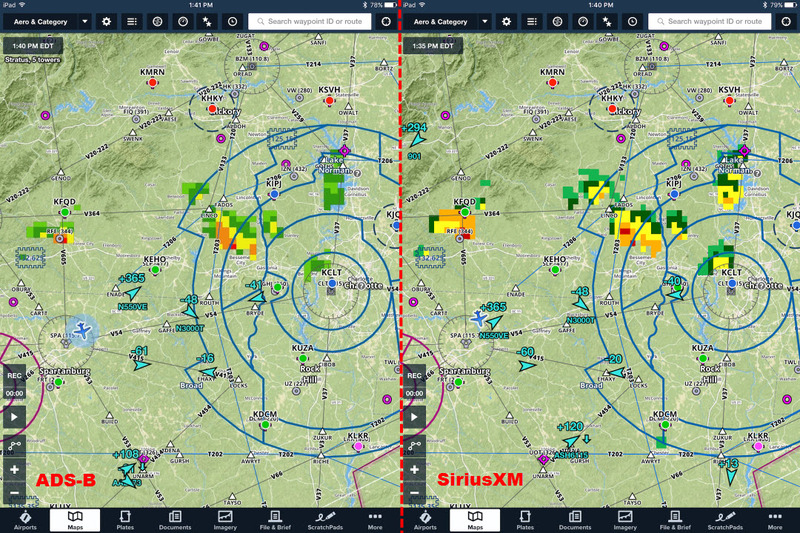 Echo tops received through SiriusXM do not go through a rigorous filter like you may see with the two radar layers. Therefore, it is normal to see echo top clutter around and near the various NWS radar sites as shown below. 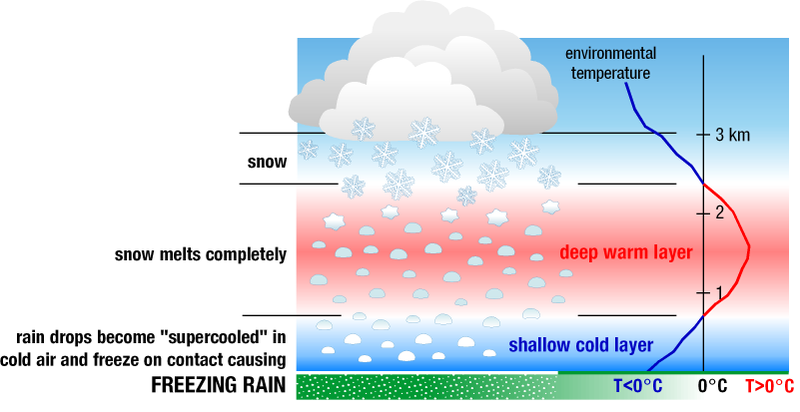 Typically these are not associated with real areas of precipitation and often occur during fair weather. Simply moving the altitude selector up to the next rung at 5,000 feet will remove many of these annoying areas of clutter. 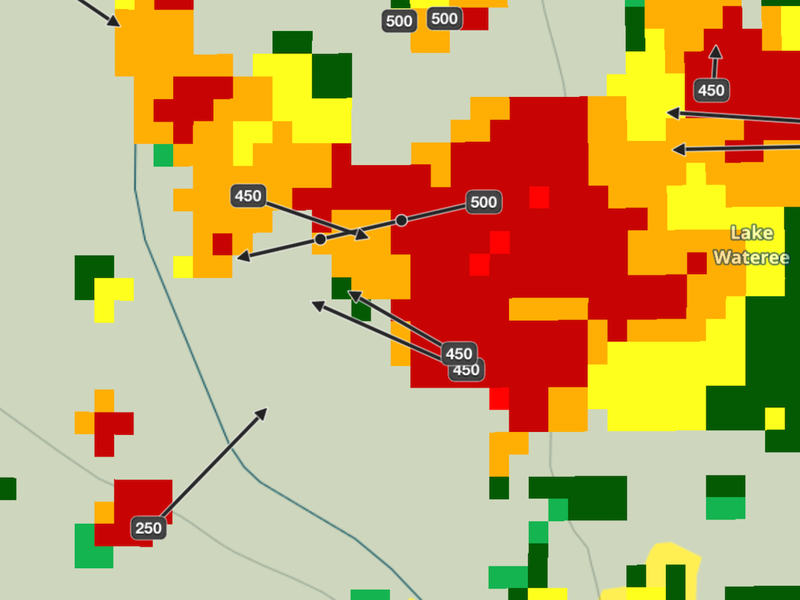 Echo tops clutter showing tops below 5,000 feet will often occur around the various NWS radar sites. Here you can see clutter around the NEXRAD sites at Charleston, W. Va., Sterling, Va., Dover, De., and Mount Holly, N.J. 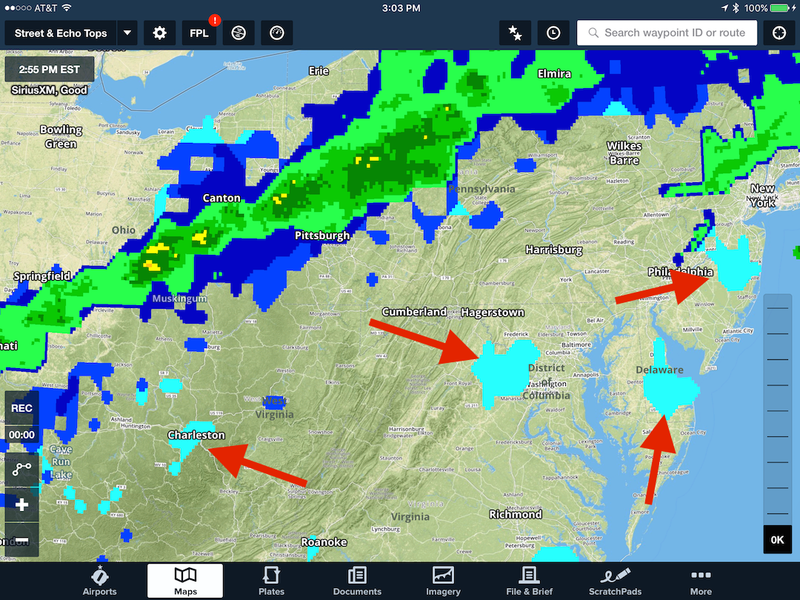 The radar depictions you see from the SiriusXM broadcast are highly filtered to provide only real precipitation areas. Ground clutter, anomalous propagation, birds, insects and such are carefully removed to provide the cleanest and most representative image. But like any process, there will be times where non-precipitation returns do not get filtered out. More importantly, you may see real areas of precipitation filtered out as well. While rare, the latter usually occurs in regions where WSI (the weather provider for SiriusXM) implements what is called a manual gross filter. This kind of filter is the most efficient way to eliminate any clutter in large areas that are not expected to see precipitation. But when that filter is left on too long, it’ll be just as efficient at removing real precipitation from the broadcast. 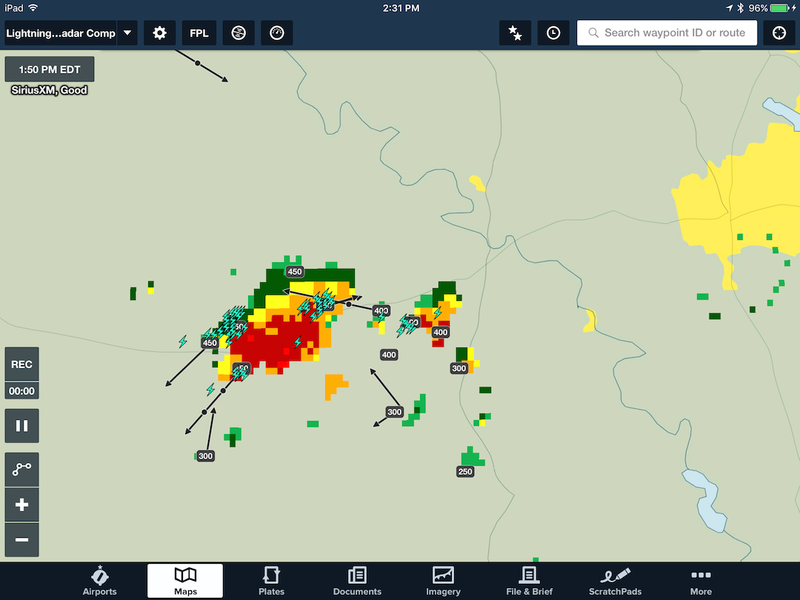 Lightning and a single hail storm attribute marker with no radar depicted. Here’s one such example depicted above. 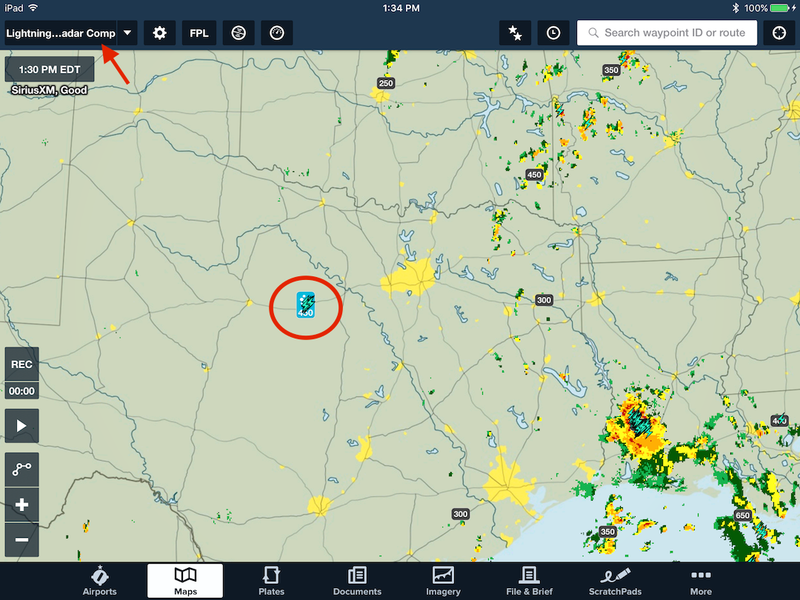 While connected to the SXAR1 I panned the map over Texas and I saw some lightning and a lone hail attribute marker showing echo tops at 45,000 feet in north-central Texas, but no radar returns. Hmmm? I verified that I had the Radar Composite turned on (I did) and zoomed the display out as shown below to see that there are plenty of other precipitation areas shown to the northeast and southeast of this area. 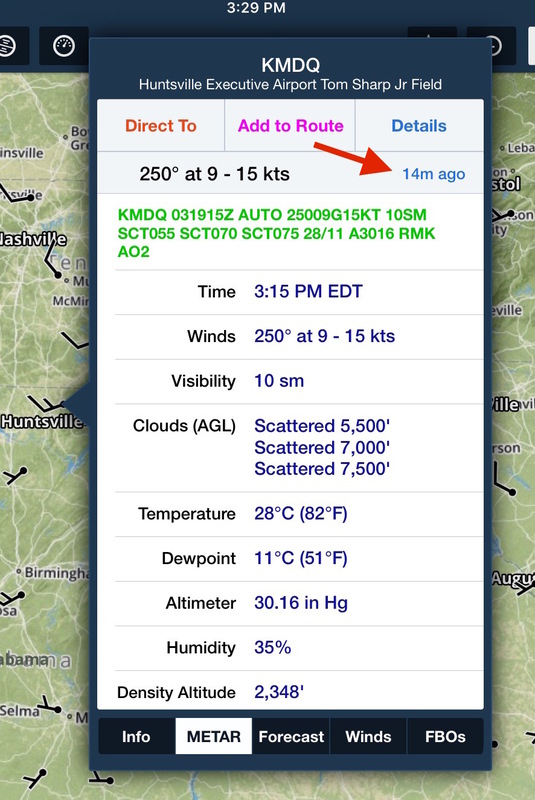 Given that the area wasn’t cross-hatched with “Radar not available” why wasn’t there any precipitation shown? Zoomed out to show the presence of other precipitation on the radar composite. About 15 minutes later I came back to the map to see if there was any change. 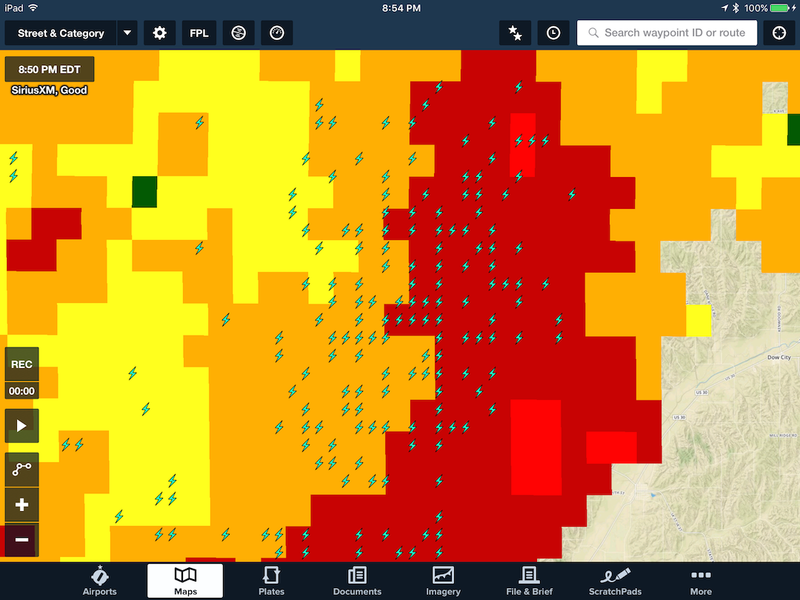 Notice below that plenty of lightning and storm attributes are being depicted here in north-central Texas; however, there are still no radar returns being rendered. Given this activity, you’d expect there to be some precipitation shown when both lightning and storm tracks are present. This is a classic indication that the real precipitation in this region was being erroneously filtered. This is a classic signature for a gross filter being left on too long. With the radar composite on, no precipitation is being shown despite the presence of lightning and storm tracks. Just five minutes later, the gross filter was removed by WSI and the returns suddenly popped into existence as you can see below. Once the gross filter was removed, the NEXRAD returns associated with these thunderstorms were rendered. I took a look at the NEXRAD archives and discovered that the first precipitation developed in this region around 12:05 p.m. CDT. The gross filter wasn’t removed until 12:50 p.m. CDT. That’s 45 minutes with no radar for this area of rapidly developing and potentially severe thunderstorms. Moral of the story is to always have lightning ON and be sure the SiriusXM Storm Markers are also set to ON in the Maps Settings menu (the gear button on the Maps view). Having both of these layers on will likely expose these kinds of uncommon events. 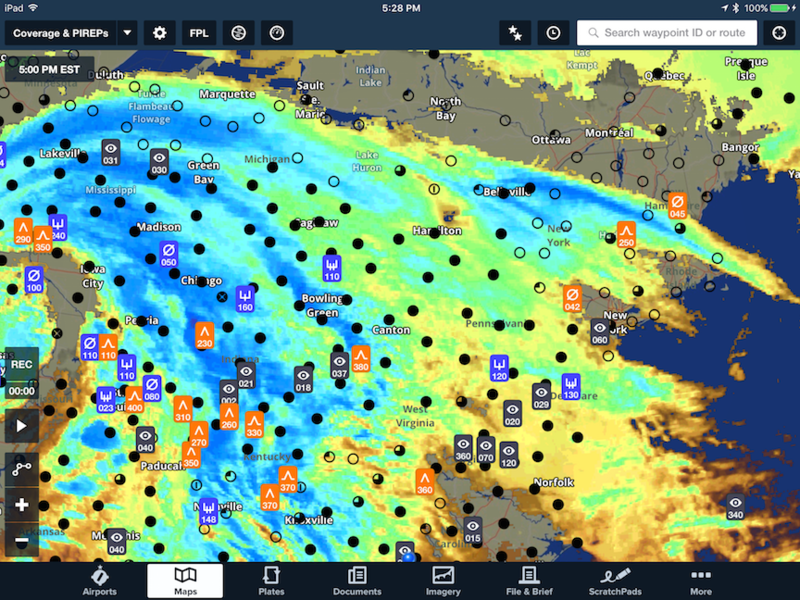 Now that ForeFlight Mobile 7.7 introduced a second radar layer to the app, what are the practical advantages of each? As I mentioned in my earlier blog post, the composite reflectivity and lowest tilt radar layers both provide a high glance value to the pilot to highlight the location and movement of the truly nasty adverse weather. But I think you’ll find that these two layers are more often similar than they are different. 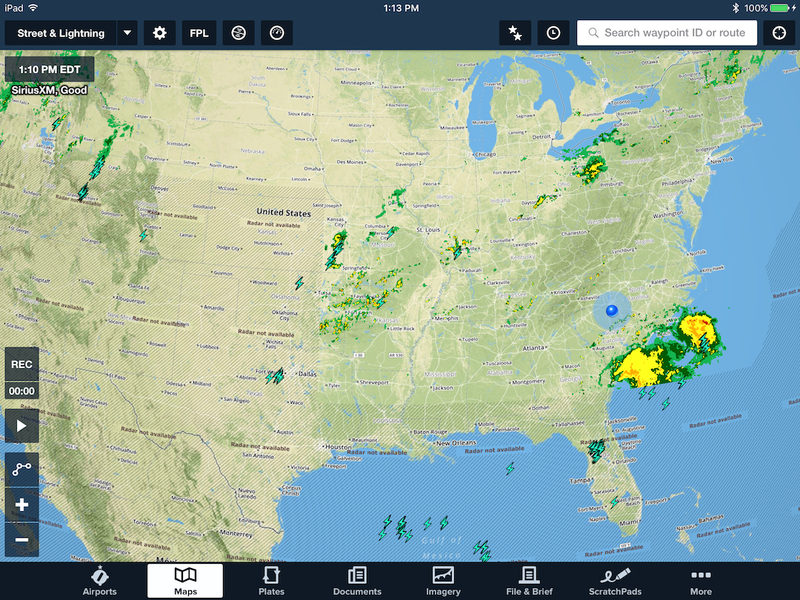 Go to any pilot gathering discussing weather and you’ll likely discover a majority of pilots genuinely swear by the composite reflectivity mosaic. 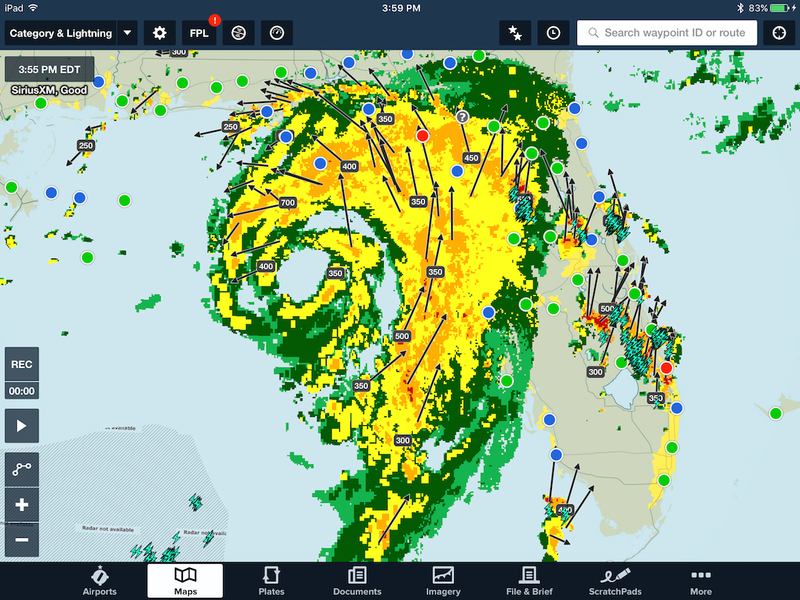 In fact, you may even hear a few so-called “experts” stand up in front of an audience and attempt to convince them that you should only ever use composite reflectivity. 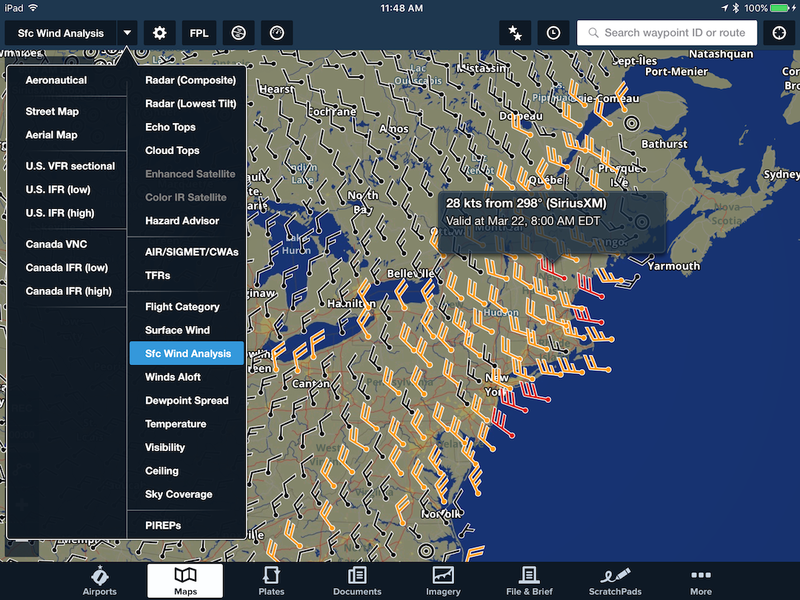 Depending on your particular flying habits and aircraft capabilities, you may find that the base reflectivity from the lowest tilt is actually more useful and accurate. However, before we get into the pertinent differences, let’s examine how each mosaic is built. 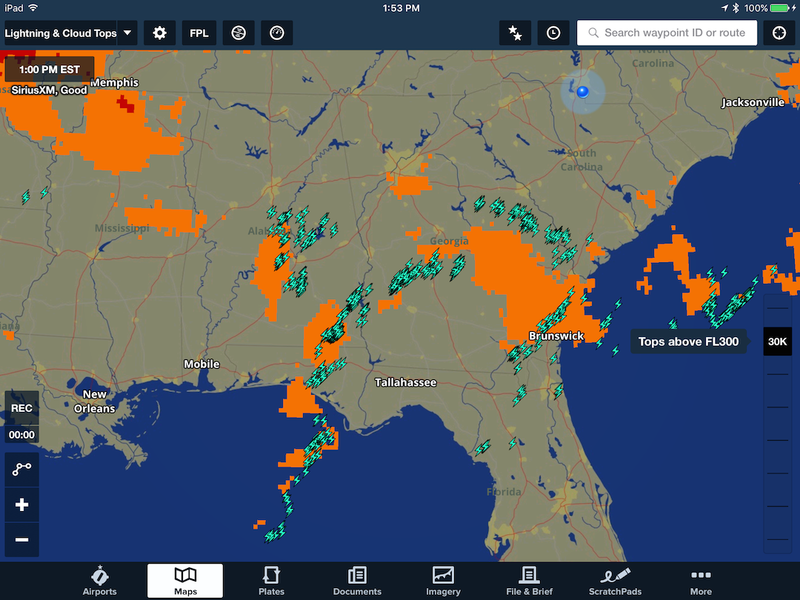 Every NEXRAD radar site throughout the U.S. scans the sky with multiple 360-degree sweeps at increasing elevation angles. It starts the process (called a volume coverage pattern) at 0.5 degrees and finishes at 19.5 degrees assuming the radar is in precipitation mode. 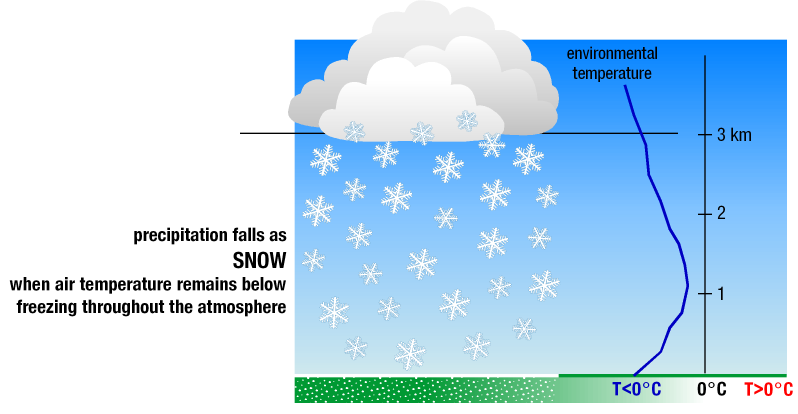 The base reflectivity from the lowest elevation angle (called the lowest tilt) is most representative of precipitation, if any, that is falling out of the base of the cloud and reaching the surface. So the lowest tilt is what interests most of the general public so that’s what you are likely to see on various websites that depict weather radar. 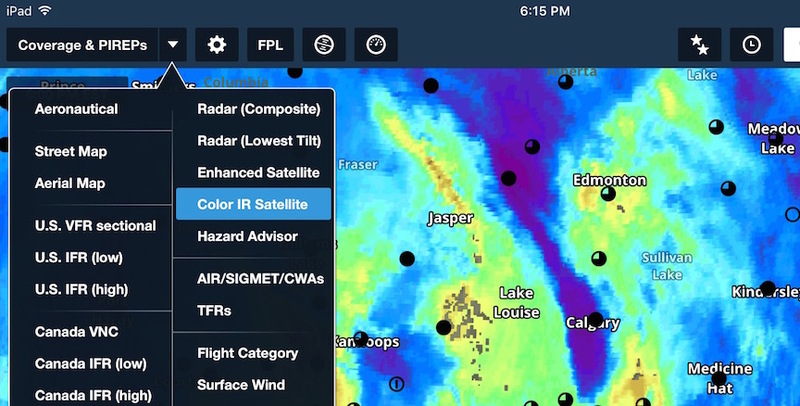 The composite reflectivity, on the other hand, includes the base reflectivity from every elevation scan. Depending on the scanning strategy of the particular radar site, this could be up to 14 different elevations. The highest base reflectivity value from each of these elevations is what’s included in the composite reflectivity mosaic. Consequently, you don’t know if the reflectivity depicted is near the base of the cloud, somewhere in the middle or near the top simply by looking at the mosaic. A cross section of this mesoscale convective system (MCS) provides a better indication of the altitude of the highest reflectivity in the storm. 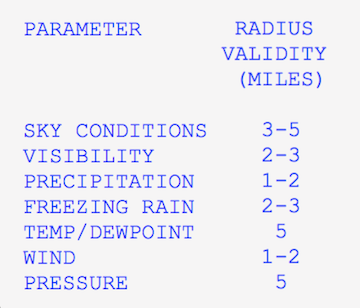 In this case the precipitation core is below 6 km or 20,000 feet. One of the chief issues with the composite reflectivity mosaic is that it often has a very large footprint when compared to the lowest tilt. It tends to exaggerate the areal impact of the precipitation event making it challenging to determine where it’s safe to fly. 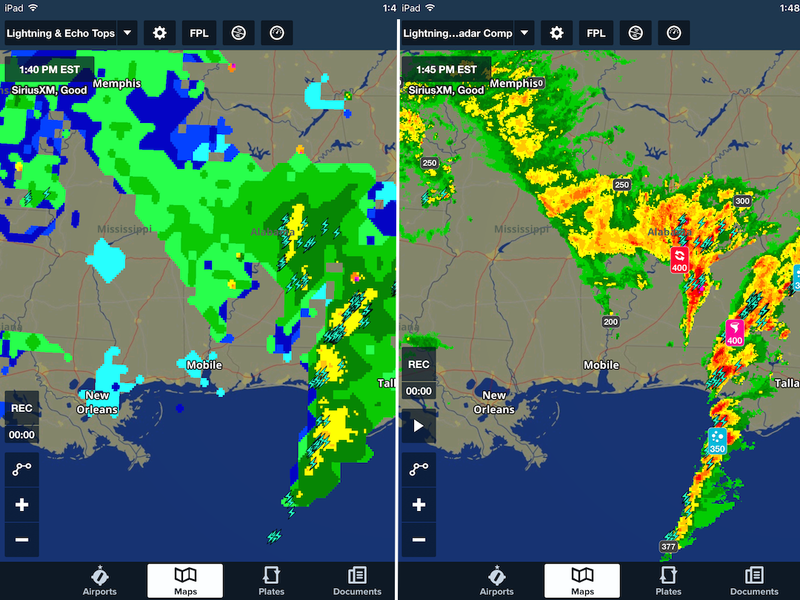 Shown below is a two image animation over the southeastern Florida peninsula that toggles between the composite reflectivity and lowest tilt. Notice on the composite reflectivity mosaic at least one-half of the area depicts returns that are not likely to be actual precipitation falling from the sky. Most of the green contours to the northeast of Lake Okeechobee are low dBZ returns from ice crystals in the thunderstorm’s anvil and are not likely a threat to pilots flying at lower altitudes 10 or more miles from the storm, but below the anvil. An animation comparing the composite reflectivity and base reflectivity from the lowest elevation angle (lowest tilt). 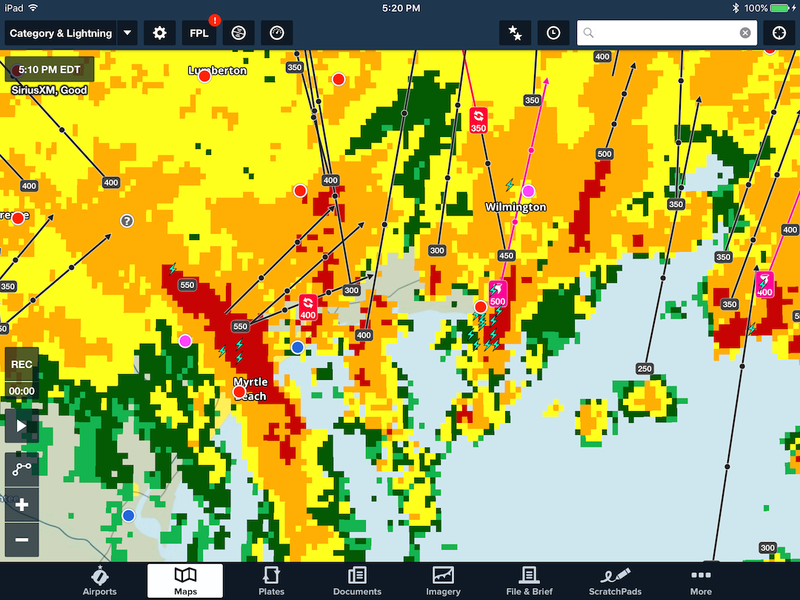 If you fly a turbojet aircraft in the upper flight levels, the composite reflectivity mosaic can be quite important to examine. The thunderstorm anvil like the one shown above can contain a high enough concentration of ice crystals (called high ice water content) to be a problem. These ice crystals can be ingested into jet engines causing power-loss or damage within the engine core. Engine instability such as surge, stall, flameout, rollback and damage of compressor blades due to ice shedding have been reported in these conditions. 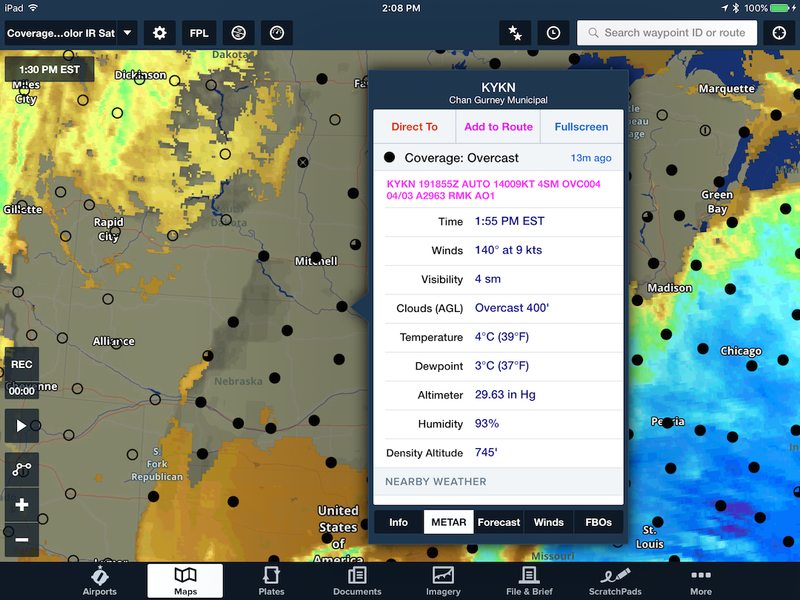 So if you are a pilot circumnavigating deep, moist convection in a turbojet aircraft, the composite reflectivity mosaic provides some indication of where the high ice water content may be located. 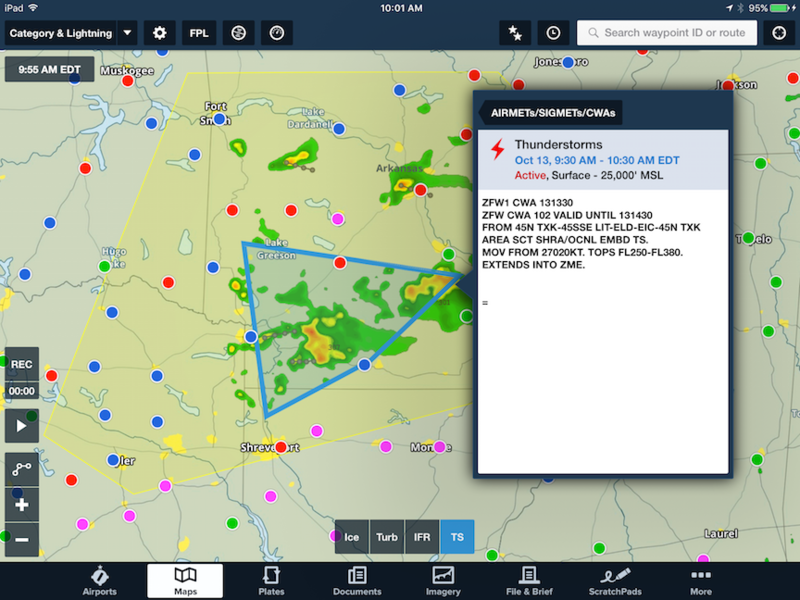 During the warm season when thunderstorms are the most common, the lowest tilt depiction is one that is useful to pilots that like to fly down in the bumpy air below the cloud deck. 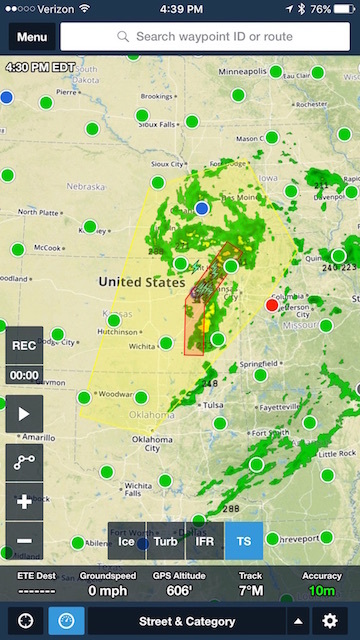 Typically the footprint of the areas of precipitation will be less giving pilots a cleaner image leaving behind just the cellular structure that’s most important when flying within a convective environment. Even so, it’s still important to keep your distance. Bear in mind that nasty convective wind shear often occurs below building convection or when flying near mature thunderstorms. Gust fronts from thunderstorm outflow as well as microbursts are the biggest threats especially with high-base convection. What about the radar from my Stratus? 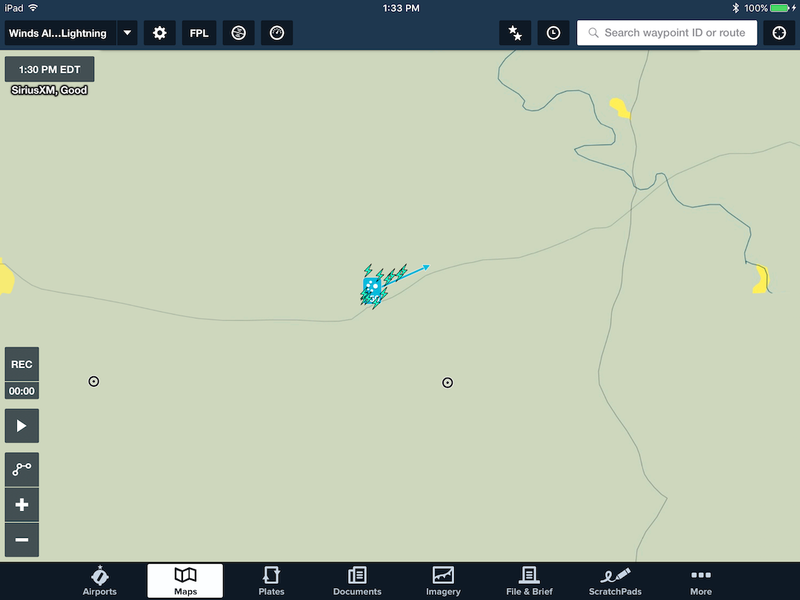 At the moment, the base reflectivity from the lowest elevation angle isn’t part of the ADS-B broadcast. 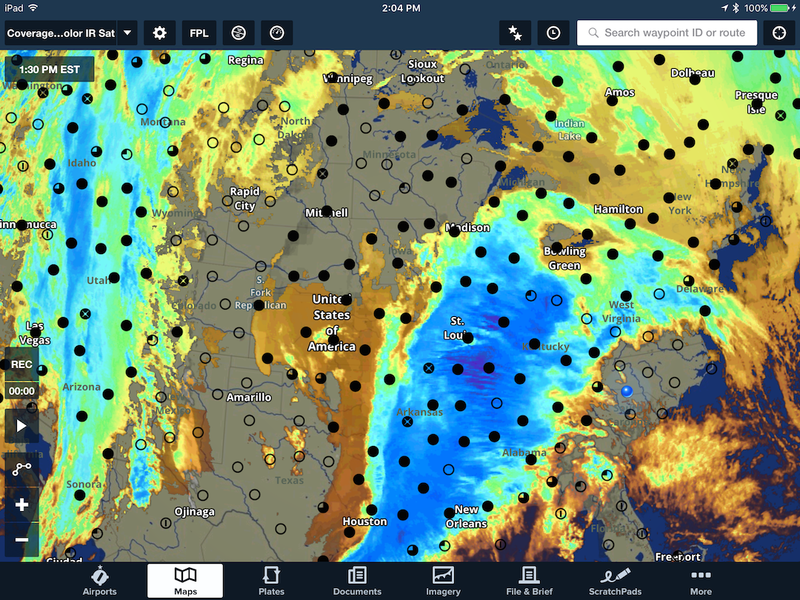 So while en route you will only have the regional and national composite reflectivity mosaic available. The current provider of ADS-B radar does a good job removing most non-precipitation returns, however, they don’t broadcast any returns below 20 dBZ which is typically what you’d see in areas with a thunderstorm anvil. 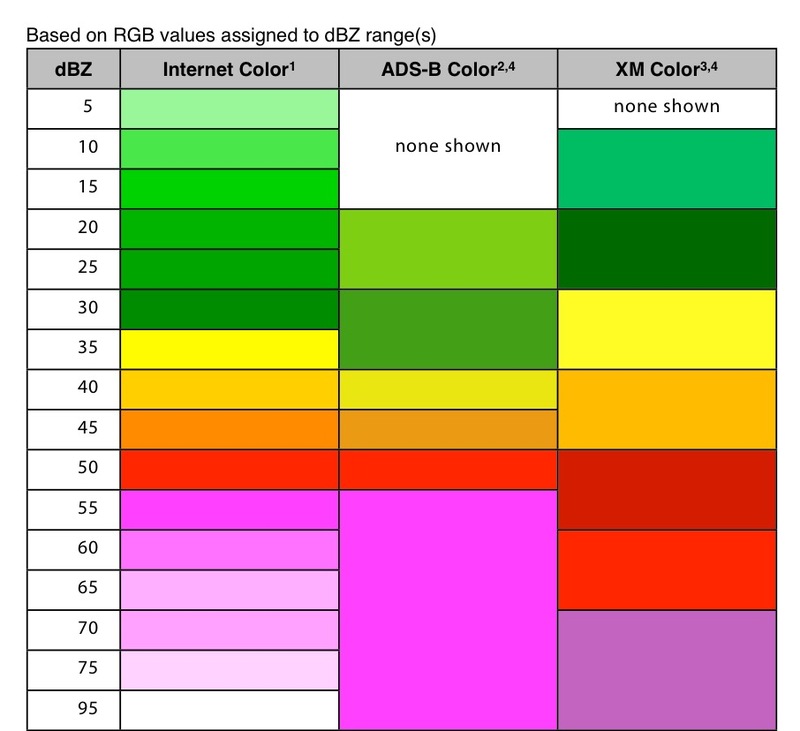 Here is the ForeFlight mapping of colors to dBZ levels found in the Pilot’s Guide. 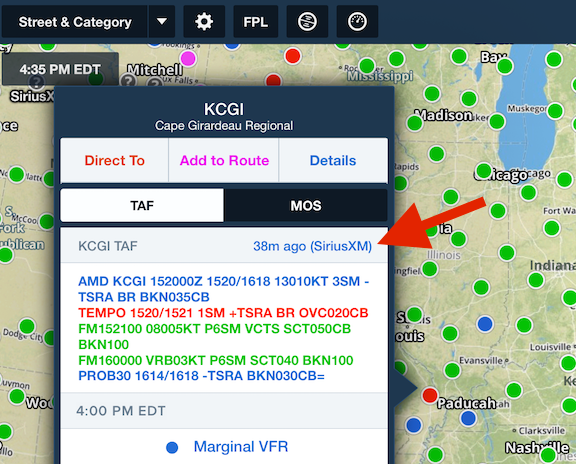 Notice that the first shade of green under ADS-B doesn’t start until 20 dBZ whereas the Internet scheme starts as low as 5 dBZ. 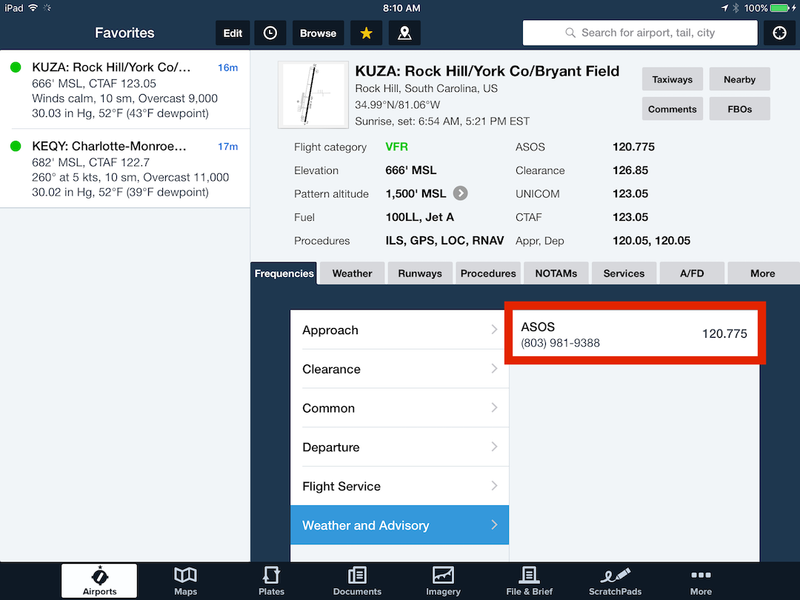 In the end, when both depictions are available as they are in ForeFlight Mobile, each radar should be given its due time during your preflight analysis.